Jeffrey Court is pleased to introduce Jeffrey Court University, an educational video series aimed at guiding tile dealers, distributors and consumers through the in’s and out’s of Jeffrey Court’s collections affectionately known as “Chapters.” In an effort to provide fundamental product knowledge, Jeffrey Court University aims to make learning the Jeffrey Court “Chapters” entertaining, quick, and painless. Also outlined in the series will be: basic terminology, some design basics, new collections as they are released, and a forum in which viewers can request additional subject matter. To furnish the true vision of educating customers on the very best of the Jeffrey Court Collections, Jeffrey Court University’s video series includes 14 videos (an introduction on each collection), as well as accompanying resources to further brand knowledge. “Jeffrey Court strives to be the most approachable decorative tile brand in the marketplace. A lot of time and effort goes into making sure every chapter has all the components needed to easily create first cabin designs and installations. What is great about Jeffrey Court University is it creates an entertaining, self-paced, forum to gain an in-depth look at every chapter,” added Andrew Casanova, Jeffrey Court’s Marketing Director. 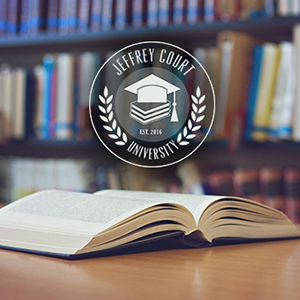 By highlighting the basics of Jeffrey Court’s industry-leading designs and products, Jeffrey Court University’s educational venue and video series provides customers with invaluable product resources and information.